No one is reading your directions. TL;DR: People treat directions as though they are an FAQ or troubleshooting guide, reading them only if and when needed. Design your activities to be intuitive. Don't waste your time writing instructions most people won't read. Your class is a halfway through a chapter test. The room is silent. The buzzing of the fluorescent lights soothes you into another sip of coffee as you watch your students deep in thought--or panic. It's hard to tell. Suddenly a hand goes up. "Frau, what are we supposed to do here, for number two? I don't get it." You sigh as you think about your thoughtful instructions, a carefully worded paragraph centered within a box and accented by strategically bolded, color-coded text. And anyway, why is this kid asking about number two an hour into the test? "Did you read the directions?" you ask between gritted teeth. The student gives you a blank stare. You walk to his desk knowingly, flip the test back a page and point to your neatly typed opus. The student looks down and says, "Oh." 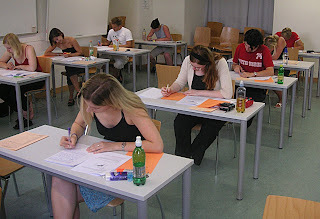 Twenty minutes later, the student is still confused and is flipping back and forth between the directions and number two with increasing frustration. Later that night, you see that 90% of your students completed the problem incorrectly--including the student you talked to. They didn't follow directions. Why didn't they raise their hands?? you ask yourself. If you are the teacher in this scenario--as I have been many times--congratulations! You have succeeded in wasting your own time writing up instructions that almost no one read, in making the student who was brave enough to raise his hand feel even dumber than he did prior to asking the question (which is why no one else asked you for help, duh), and perhaps most importantly, in failing to assess your students' ability to perform a critical task. In short: your design was poor. Human beings are hard-wired to take shortcuts. How many times have you clicked "yes" to some Terms of Service without even considering reading it? Have you ever gotten horrifically lost while taking a shortcut because the thought of saving even five lousy minutes was enticing enough to get on back roads you were wholly unfamiliar with? Do you bother to look at the infuriatingly confusing graphics Ikea includes with its furniture? Is it any wonder that Twitter, with its 140-character limit, quickly surpassed paragraphs-long blogs in popularity? Or why people are more likely to glance at a picture on Instagram than read five lines you posted to Facebook? Human proclivity for shortcuts is why we often have "teal deer" sitting at the top of "wall-of-text" length articles--like this one! Most people learn by doing and will jump into an activity first and only reach for the directions if and when a problem arises. In other words, your directions more often function as an FAQ or troubleshooting guide rather than a road map for how to complete a task--whether you intended them to or not. Design tasks to be intuitive. As much as possible, students should be able to glance at something and immediately understand how to interact with it. Provide models for students to look at and/or engage with. Break tasks down into simpler, more obvious steps. Make it impossible to do the wrong thing. Leverage technology tools to help you with this--like creating a quiz on a Google Form that literally will not let students move on to the next question until they answer the current one correctly. Actually design your directions to be an FAQ or trouble-shooting guide by using bullet lists, brief phrasing and key words that are easy to reference.